Continuity mistake: In the fight with the silver samurai, after Wolverine loses his claws from one hand, he takes a sword. Twice he goes to the ground, and in that shot there is no sword in his hand, then it appears again. Factual error: In the Shinkansen fighting scene, the railway line is seen having color light signals along its way. But the Shinkansen uses a signalling system that doesn't involve the use of light signals at all. 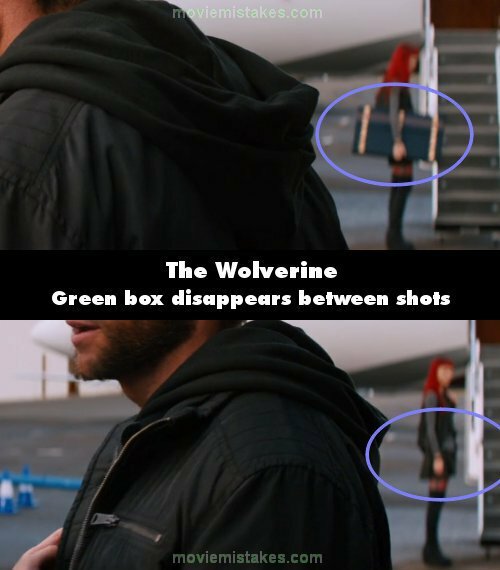 Continuity mistake: As Wolverine bids farewell to Mariko in the next to final scene on the airport tarmac, Yukio is visible in the background of the shot standing at the foot of the stairs, where she receives a green box which she tucks under her arm. The scene cuts to Mariko, when it moves back to Wolverine, Yukio remains in the background but the green box has disappeared. Other mistake: Wolverine shields Yashida from the blast, burning off all his hair. Somehow his pants manage to remain unaffected by this, as seen later when they are climbing from the pit. Continuity mistake: When Logan fights with Shingen, Yukio gets a small wound on the left side of her face which increases in size after the fight. Continuity mistake: When Mariko and Logan are eating, Logan uses a fork and leaves his chopsticks sticking straight up out of the bowl. Mariko removes them and lies them flat, saying it's bad luck. Then they keep talking and suddenly the chopsticks are vertical again without him touching them. 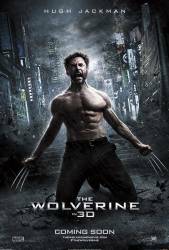 Factual error: In the scene where Wolverine fights the ninjas on the bullet trains: 1) the shinkansen bullet trains are electric and have pantographs and overhead power lines - neither are visible. 2) None of the bullet trains have skylights. Visible crew/equipment: In the funeral scene where Logan is attacked, he gets shot and knocked down. The camera pans towards Logan and we get a close up of his exposed claws. If you look in his fist you can see Hugh Jackman is holding on to a round gold colored object in plain view. This is the handle Hugh Jackman holds on to for his fake movie prop claws. Continuity mistake: After Logan takes out the spider from his heart he has blood on his abs, which disappears when he fights with Shingen. Continuity mistake: When the red headed Asian girl pulls the car over in the beginning, Logan is looking at her. But the camera changes angles to his perspective and he is suddenly looking straight forward. Revealing mistake: In the funeral scene where Dr. Viper Lady is videoing Logan fighting, she starts lowering the smartphone, but the "faked" image on the screen doesn't change to match her arm dropping down. Continuity mistake: When Yukio is holding a knife to Logan at the grandfather's place, it alternates from being vertical to slanted between shots. Continuity mistake: Just as Logan and Mariko are about to enter the room at the "love hotel", the door opposite their room shows a teddy bear on the door, but when it switches to the view from inside their room the opposite door now shows a stethoscope. Suggested correction: They're two different doors and the teddy bear room isn't opposite their room. The teddy bear room is #30 and the stethoscope room is #31. Visible crew/equipment: When the bear appears as Logan goes to buy batteries, a cameraman with a brown jacket can be spotted at the lower right hand corner, before the shot changes. Revealing mistake: When Logan slices his abdomen open to pull out the parasite around his heart, watch the (digital) wound at the bottom of the screen right before he says the line "You're not gonna wanna watch this part!" Not only does a small line of blood on the left of the wound simply "blink" into existence instantly at the bottom of the screen right after he pulls the claw out (slip up in rendering), but the wound itself doesn't quite 100% match up with Logan's movements - when he breathes in, the wound doesn't really move properly with his abdomen as it inflates. Continuity mistake: The note that says "come and get her" in blood changes when Yukio pins it to the wall. The letters are written differently. Suggested correction: The letters are in the same way. Watch the scene again. They are different, they are in a different position too. Continuity mistake: In the bar Logan drops just a bit of liquor on the guy with the arrow on his hand, but in the next shot a lot more is flowing over the wound. SPOILER! There is a mid credits scene that shows Logan going through airport security 2 years after the end of the movie, where he encounters Professor X and Magneto, who recruit him for a new mission that will be in the film X-Men: Days of Future Past.